For nearly 75 years, Jeep has been not only one of the most capable vehicles in the world, it’s most recognized as well. 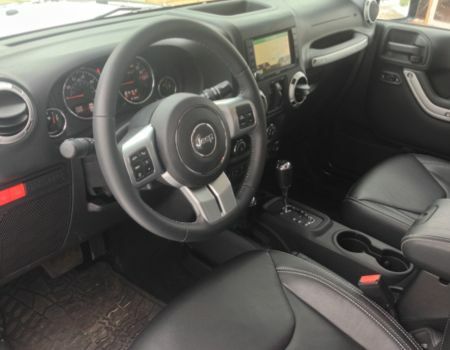 The Jeep Wrangler is also one of the most-honored vehicles in the off-road spectrum, so what better way to spend nearly a week of icy winter weather than behind the wheel of the 2014 Jeep Wrangler Unlimited. No sooner had I learned of an impending visit by old man winter did the Wrangler Unlimited in Rubicon X trim land in my driveway. 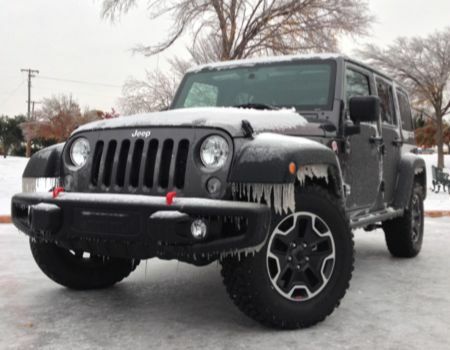 Sub-freezing temperatures and a blanket of sleet and ice were no match for the Jeep. 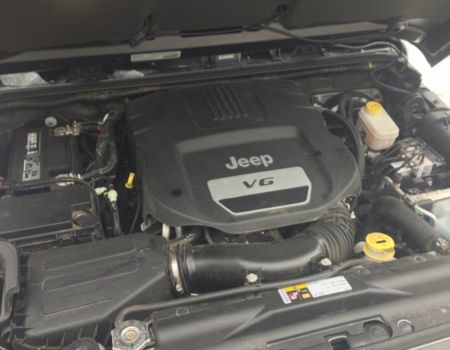 One of the best things to happen to the Jeep Wrangler lineup in recent years is the introduction of the Pentastar 3.6-liter V-6 engine that generates 285hp and 260 lb. ft. of torque and delivers fuel efficiency up to 21 mpg highway. The V-6 is mated to your choice of five-speed automatic or six-speed manual gearbox. Our tester arrived with the automatic that offers manual shift control. Sport and Sahara model Wranglers arrive with the Command-Trac transfer case, while this Rubicon is equipped with the Rock-Trac transfer case for a greater gear ratio range. All Jeep Wranglers feature Dana axles front and rear and on Rubicon models these are electronic locking, and for further enhanced off-roading the Wrangler Rubicon features an electronic front sway bar disconnect and rides on monotube high-pressure gas shock absorbers. The Rubicon X package added stylish 17-inch semi-gloss black wheels with all-terrain tires to our tester, along with steel front and rear bumpers with red tow hooks and side rock rails. A power dome hood with functional heat extractors gives the Jeep a more powerful look, while hill descent control, traction control, electronic stability control, hill start assist and trailer sway damping help keep things under control no matter what the terrain. This Wrangler Unlimited featured the Freedom Top three-piece hardtop roof but like all good Jeeps Wranglers the roof and doors are removable and the front windshield will fold flat to the hood should the mood strike you. 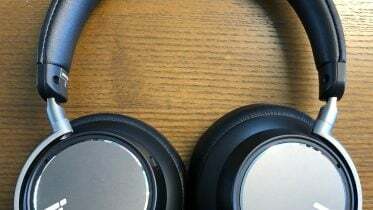 The primary difference between a Wrangler and Wrangler Unlimited is the extra two rear doors and the stretched wheelbase. While Jeep Wranglers are not afraid to get down and dirty they still offer a good deal of refinement as our tester showed with its leather interior, heated front seats, accent stitching, silver interior accent trim, Uconnect infotainment system with navigation, 40GB hard drive, SiriusXM satellite radio and TravelLink, and — last, but certainly not least — this week I’ve appreciated having the remote start system to have the Jeep completely thawed when I was ready to head out into the nasty weather. Pricing for the 2014 Jeep Wrangler Unlimited begins at $26,195 with this Rubicon X model arriving at $43,270. 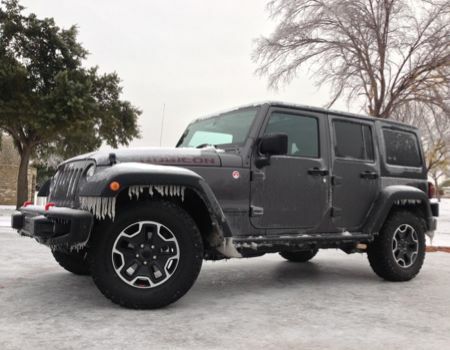 When seeing a weather forecast such as the one we were given here in North Texas last week, the list of vehicle preferences is very short — with Jeep certainly near the top. 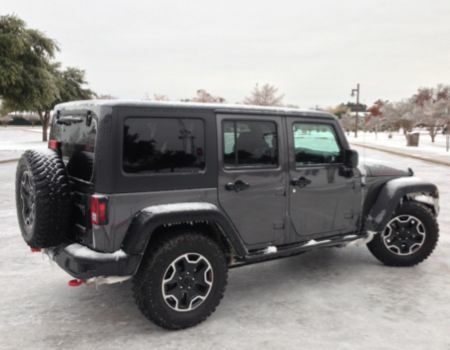 This Wrangler Unlimited Rubicon X fits the bill perfectly, come rain, sleet, and ice.